QUEBEC CITY – It seemed fitting that the weeklong 49th International Eucharistic Congress ended on a battlefield. Some 55,000 people celebrated the theme of the congress, “The Eucharist, Gift of God for the Life of the World,” in a Mass where almost 250 years ago British and French soldiers shot each other down. Instead of a memorial to death, the high plateau known as the Plains of Abraham became a celebration of eternal life. The congress, which ran June 15-22, continually posed such contrasting images. Through the 400-year-old streets in one of North America’s most secularized societies, about 25,000 pilgrims paraded with the Eucharist in a candlelit procession June 19. It was one of the most vivid displays of religious fervor seen in Quebec in half a century. At a time when the Catholic Church is lamenting an aging and declining priesthood, 12 young men were ordained June 20 in a three-hour liturgy marked by tears, cheers and standing ovations. Cardinal Marc Ouellet of Quebec described the ordination as “the turning point” in a renewal of the church in Quebec. In the safety of an arena on the Expo City site where the events of the congress unfolded, 12,000 pilgrims heard stories of courage. They listened to Marguerite Barankitse, a Burundian woman who almost lost her life trying to save Hutu people from her own Tutsi people. She now runs a network of shelters for child victims of war. In an inspiring talk, Canada’s Jean Vanier noted that the poor and the marginalized are crying out for love and relationships, not just generosity and ideas. Mr. Vanier, the founder of the International Federation of L’Arche Communities for people with developmental disabilities, said June 16 that Christians are called to be like Jesus, with their hearts open to all the poor and disadvantaged. The congress also had a youthful atmosphere. There was a special hall to highlight the contributions and needs of youths. On June 21 a youth vigil featured high-energy music and testimonials. 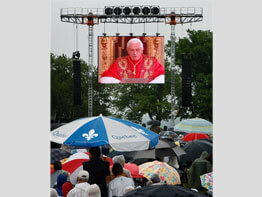 The youth rally included a taped message from Pope Benedict XVI. He assured the pilgrims of his prayers and encouraged them to meditate on the great mystery of faith, the Eucharist. The Eucharist allows believers to relive the sacrifice of Jesus through which he saves the world, he said; it is also nourishment for everyday life. “Allow yourselves to be transformed and to be bearers of peace and of his message of love,” the pope said. The congress also had an ecumenical dimension. The Rev. James Christie, a minister of the United Church of Canada, said he was humbled to be invited to offer a Protestant perspective on shared Communion. Cardinal Peter Turkson of Cape Coast, Ghana, provided the Catholic perspective during the June 18 session, while Anglicans and the Greek Orthodox Church also were represented. Despite their agreement in many areas, Christians “are hardly yet able to speak of a common table” when it comes to Communion, said Rev. Christie, who also is the Canadian Council of Churches president. While there was some criticism of the mainstream media’s coverage of the congress, especially over its emphasis on piety, most pilgrims were pleased with the week. Victoria Coyle of Brantford, Ontario, was impressed by the diversity of languages and races represented. “Seeing different parishes from all over the world come together to share our faith, it’s like a new light is shining,” she said. The pope said the Eucharist does not separate Catholics from their contemporaries, but as the supreme gift of God’s love calls them to make the world a better place. The Quebec congress was the latest in a series that began in France in 1881. They normally take place every four years and bring together laity and clergy from around the world to worship, pray and learn about their faith with a focus on the Eucharist. The next congress will take place in 2012 in Dublin, Ireland.